Now in our fifth year! 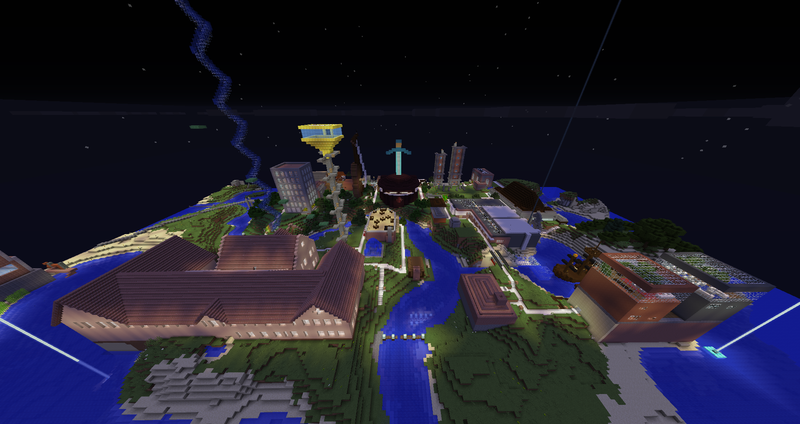 Come talk/play Minecraft with us! The NMT Minecraft Club is about bringing together NMT students, staff, and alumni who enjoy wide spacious digital worlds of Minecraft. Our goal is to build an active community of Minecraft players and support and develop custom game server(s) for all of NMT to enjoy. We work together to create, compete, and survive in classic Minecraft and Minecraft based gaming events. We hold regular special events on our servers and semester to semester events across campus for interested players to have fun and compete. Our Main Server hosts multiple worlds: a constructive Homeworld without PvP, a challenging and a regularly refreshed exotic wilderness, and extreme survival map with no-holds PvP with higher stakes and higher rewards. Our Modded Server is a customized game "Age of Titan" based on the anime Attack on Titan, the game Age of Empires, and other random bits and mod-packs that have been thrown in that are not canon. ALL PLAYERS ARE ENCOURAGED TO READ!